« Bont A3 Road Shoes – IN STOCK NOW! 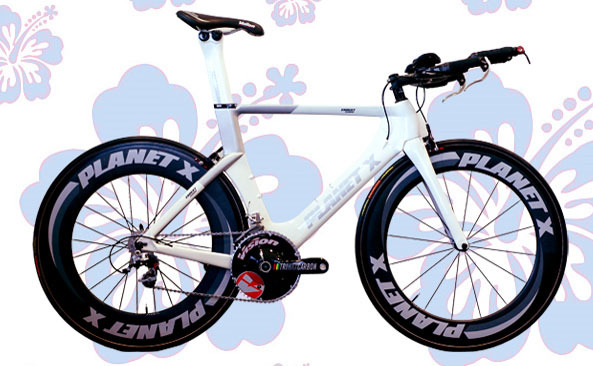 Planet X never cease to amaze us with their incredible value high performance offers. They’ve done it again with their latest offer, a super high spec build on their top of the range time trial/triathlon frame, the Exocet. Buy your bike through Bike Science Bristol or Bike Science Derby and take advantage of our 1/2 Price offer on our Level 2 Retul fit service! BOOK A FREE NO OBLIGATION SIZING APPOINTMENT AT OUR BRISTOL OR DERBY STUDIOS HERE. The Plane X Exocet Hawaii Special Edition is a simply stunning spec! All this for just £1999…. Planet X Exocet carbon frame, fork and seat post. Planet X all carbon Stealth TT bars. That’s £1000 SAVING over their previous bike at this spec. This entry was posted on Friday, October 22nd, 2010 at 10:12 am	and is filed under All Posts, Bike Fitting, Planet X Bikes, Products. You can follow any responses to this entry through the RSS 2.0 feed. Both comments and pings are currently closed.